This week, August 1st, the Rotary Club of Sierra Vista recognized Randy Sueskind as July's Rotarian of the Month for his substantial efforts in putting on the Fourth of July activities this year. Randy led a team of volunteers to ensure that the Fourth of July festivities were well run and well executed. Rotarians agreed that Randy did a fantastic job. 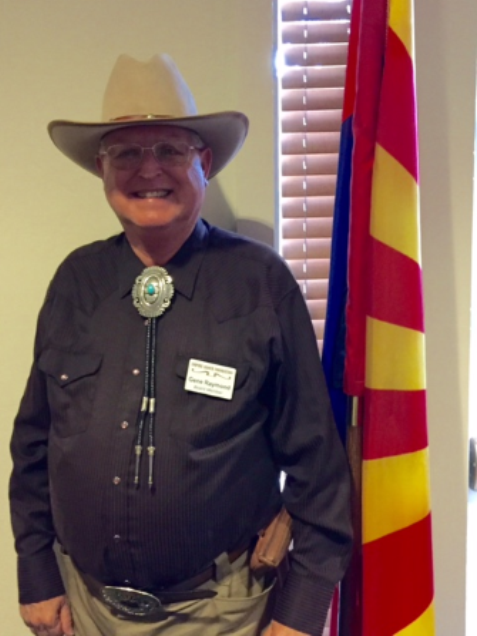 Rotarians were then pleased to hear from Gene Raymond, a volunteer with the Empire Ranch Foundation, an organization dedicated to the preservation of the Empire Ranch, a historical ranch located north of Sonoita, Arizona. The Empire Ranch was founded in August 1876 when Walter Vail and Herbert Hislop purchased a 160 acre homestead from Edward Fish and Simon Silverberg. Vail and Hislop added another business partner in October 1876 and began the expansion of the ranch. Vail ultimately acquired the entire ownership of the Empire Ranch, and continued to expand it into one of the largest cattle operations in the region. Vail and his family operated the ranch until 1928, when they sold the operation to the Chiricahua Ranches Company, owned by Henry, Frank and Charles Boice. The Boice family was well respected in the Arizona cattle industry and was known for promoting the Hereford breed in the state. In his role as chairman of the National Livestock Association Tax Committee, Frank Boice was influential in the passage of tax policy relating to the sale of cattle. In 1969, the Boice family sold the ranch to Gulf American Corporation, a national developer, who in turn sold the ranch to the Anamax Mining Company in 1975. During that same year, the Empire Ranch House was listed on the National Register of Historic Places. In 1988, the U.S. Bureau of Land management acquired the ranch lands, which have since been designated a national conservation area. In 1997, a group of private citizens created the Empire Ranch Foundation, a non-profit entity organized to protect, restore and sustain the Empire Ranch historical buildings. Working with the BLM, the Empire Ranch Foundation has contributed $500,000 to the preservation of the ranch. For more information about the Empire Ranch and activities available, please visit its website at empireranchfoundation.org.